Pápai Páriz Ferenc, Album amicorum p. 460. In manibus quae sunt, haec nos vix scire putandum est. Est procul a nobis adeo praesentia veri. Clarissimo atque doctissimo Domino Possessori hujus albi fautori atque amico ex paucis optimo memoriam sui, quaequae fausta adprecans commendat histe. Christoph. Bartholem. Holdefreund M. Dr.
Londini XII. Martii S[tilo] N[ovo] MDCCXVII. * This quotation is not from Lucretius; its source is unknown. It was perhaps written by Holdefreund himself, and topped with the name of Lucretius as a kind of a stylistic quotation mark. The holy gown of Nature hides many things; / no mortal can know everything; / admire and revere much, but / do not investigate those that are near to arcane things. For / even what we have in our hands cannot be said known. / So far are we set from truth. Christoph Bartholomaeus Holdefreund was from Quedlinburg, as we know it from his doctoral dissertation printed in Halle, and defended under the chairmanship of Friedrich Hoffmann (1660-1742): De pancreatis morbis … praeside Friderico Hoffmanno … publice disputabit … Christophorus Bartholomaeus Holdefreund, Quedlinburgensis. Halle, 1713. 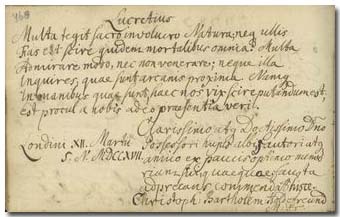 Holdefreund wrote in the album in March 1717 in London, indicating his title of doctor of medicine.